Dirty Martin’s wasn’t always dirty. The original name of the place back in 1926 was Martin’s Kum-Bak. It featured a tiny drive through, a small eating area with 8 bar stools and – most notably – a dirt floor. The patrons back in the early days nicknamed the joint “Dirty’s” because of the floor. Through the years, this classic Austin burger joint came to be known as Dirty Martin’s. 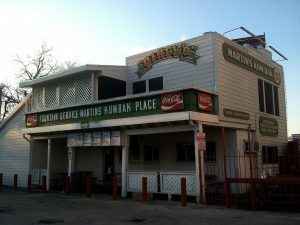 Though the dirt floor was replaced in 1951, the name stuck and Martin’s Kum-Bak accepted the new name as part of their legacy here in Austin. My first impression of Dirty Martin’s was one of familiarity. Perhaps this was because the parking lot of Dirty Martin’s was in the film Dazed and Confused. Or perhaps it’s just that I pass this place almost every day. You’ve probably passed it too. It’s centrally located on Guadalupe (“The Drag” as it’s known to locals), just north of 28th St.
Don’t be surprised if you walk in and see Mack Brown seated at the counter. Word on the street is that he’s a regular. It’s definitely a UT hang out. Photos and newspaper clippings of old UT football hang on the walls, classic rock blares from the speakers and there are plenty of televisions to watch sports both inside and out. There are three sections to Dirty’s: a small indoor section up front with bar stools, which seems to be where the regulars gather, a back room with a smattering of tables for those not in the “in crowd,” and a rear outdoor patio complete with large flatscreen televisions for sports fanatics and smokers. I opted for the back room. 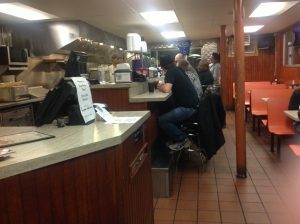 It was central and allowed me to focus on what I was there for, an honest review of Dirty Martin’s burger. Burger Patties = 7.5. The 1/4lb patties were really thin, but tasty. I don’t know if Dirty’s has been using the same grill since 1926. But if they have, it must do something special to the patties. I would definitely recommend ordering a double, or an OT Special as it’s called, because of the patty size. Normally patties this thin get no higher than a mark of a 7 with me, but Dirty’s does something right here. Never frozen, always fresh and well seasoned. I think this is the highest rating I’ve given to a thin patty. I’m even forced to go into the .5 zone, which I’ve not done before in my series. Bun = 6. The bun was not remarkable. But it was buttered, toasted and had a fresh taste to it, which bumps this score just above average. Cheese = 5. Standard slice of American cheese. Not much to say here. Messiness = 7. I went with a standard bacon cheeseburger. For as small as it was, it pretty messy. If you’ve read my burger series, you know that a messy burger is a good thing. Well, at least in my opinion. Garnish = 7. Medium thick tomatoes, fresh iceberg lettuce and extremely tasty bacon. The bacon was a little fatty, but it had a fantastic flavor. Taste = 7. The combination of magically grilled thin patties, buttered and toasted buns and above average garnish gives you a pretty decent burger taste. It’s one that’s had patrons coming back since the late 1920’s. Fries = 8. Love the fries here, hand cut style which almost tasted baked. But you pay for ’em. $2.25 for an order of fries. Would have given them a 9, but they cost extra. In my opinion, fries should come with burgers as a standard. Having said that, you get a large portion of fantastic fries for the additional charge, hence the 8. Atmosphere = 8. For conversation, stay up front. If you’re wanting more quiet, go to the middle section. For the sports crowd, outside in the back is where you want to be. Nice to have these three options. An old school Pac Man stand up video game, decent music and plenty of UT nostalgia decorates the walls. It’s a cool joint. You’ll like it. I definitely did. Cleanliness = 7. Dirty Martin’s isn’t very dirty anymore. Sure, the building is old and there are general signs of an aging establishment. But the floors, counters and tables are clean. There were some crumbs on a few seats and their mirrors could’ve used a wipe-down. But all in all, for the age of the place and the number of customers they serve, the place was remarkably clean. Other Factors = 8. Really decent beer selection, quick unobtrusive service, lot’s of free parking in a busy area and a list of other items on the menu would keep anyone happy. Add to this the nostalgia and the fact that Mack Brown might walk in and join you, and Dirty Martin’s gets a solid 8 here. Overall Score = 7.05. The overall score is the average of the 10 categories. What’s not to like about a legacy Austin hangout with a UT influence that has good food, quick service and free parking? Not the best burger joint in Austin. in my opinion, but absolutely worth a visit. Dirty’s has been pleasing people since the 1920s. If you are in Austin, you need to stop by to find out why. I’d love to hear what you have to say. Do you agree or disagree with me on Dirty Martin’s? Do you know of any places that I need to add to my list?